Hi, this is Nikki from Tikkido! I do my best creative work when I can play around with actual materials, so stacking cake pans turned out to be the best way for me to figure out what sizes of cakes I needed to bake. 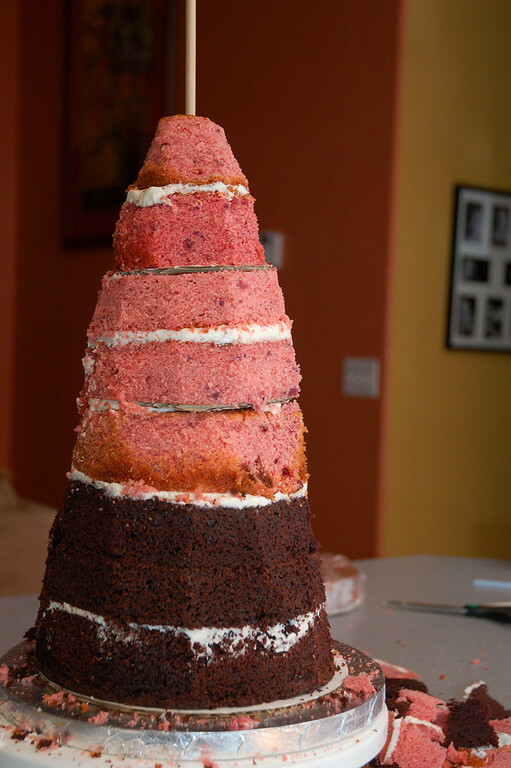 For this cake, I baked three 8″ layers, two 6″ layers, and one each of the 4, 3, and 2″ diameter layers. 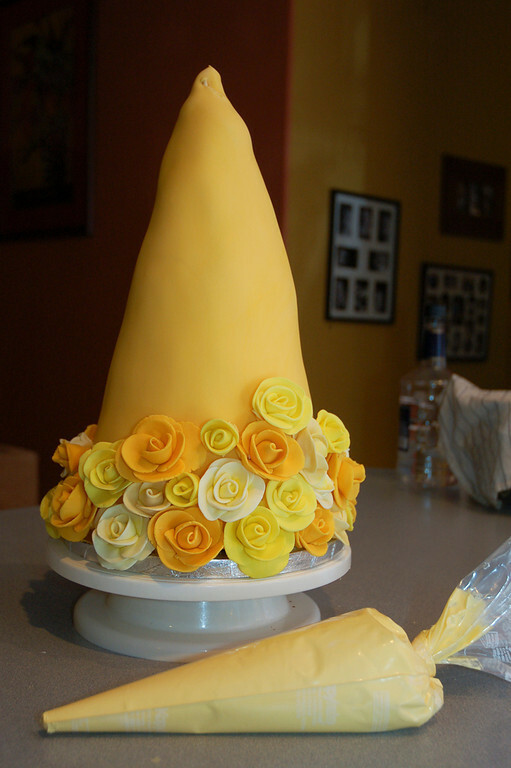 Make approximately 200 fondant roses to cover a cake this size. Gradation of color makes the cake much more interesting, so I made four batches of fondant, one with just a touch of Americolor Lemon Yellow food coloring, one with more intense Lemon Yellow, one with a light touch of Egg Yellow, and one with deeper Egg Yellow. This is the technique I use to make fondant roses. This process takes many hours, and can be done days or even weeks ahead of time. 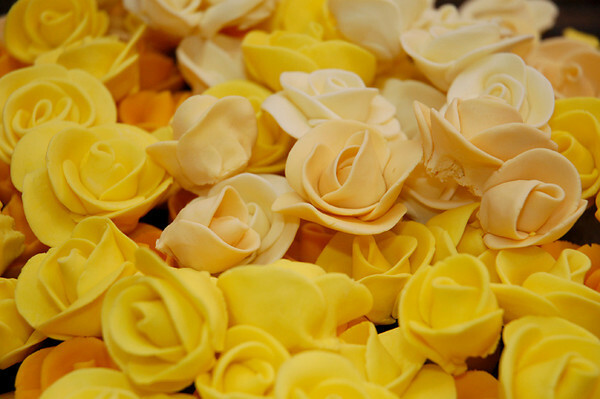 It is important that the roses be made at least several hours before placed on the cake, so that they have a chance to dry. If the roses are placed on the cake as you make them, they will compress under the weight of the roses above. It won’t look as pretty, and you’ll have to make twice as many roses. Trust me, you don’t want to make more roses than strictly necessary. Stack the cakes in a tower. 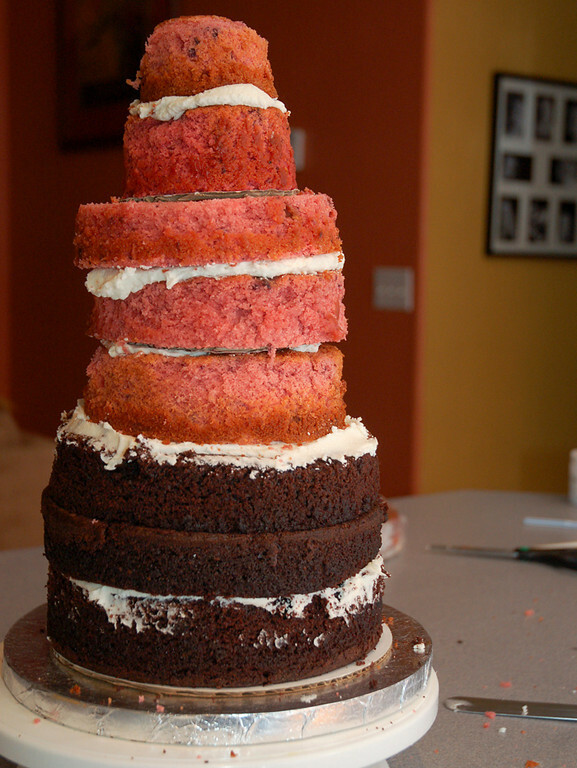 It’s important to note that you can’t just stack cake this high without creating an internal support structure using straws or dowels and cardboard cake rounds. As a rule of thumb, for every four inches of height, you should have a layer of cardboard and supports. 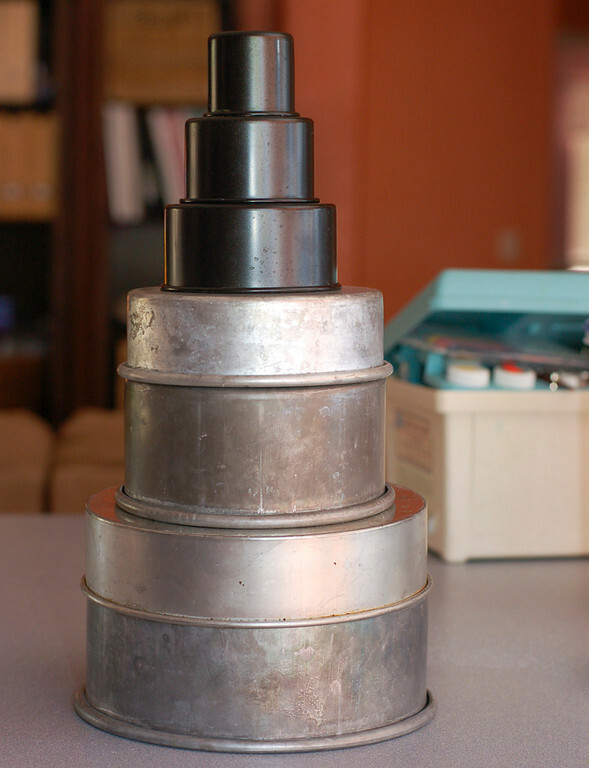 Here’s a great video from the CIA showing the basics of engineering a stacked cake. The cake won’t look pretty at this point, and that’s ok! Forge ahead. Sharpen a long wooden dowel with a pencil sharpener, and push it down the center of the entire cake. 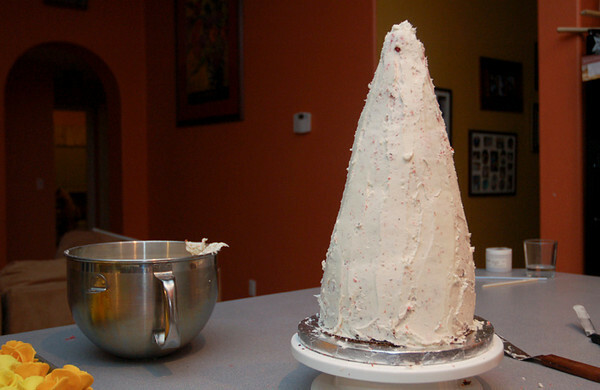 Cut off any excess wood that pokes out of the top of the cake. 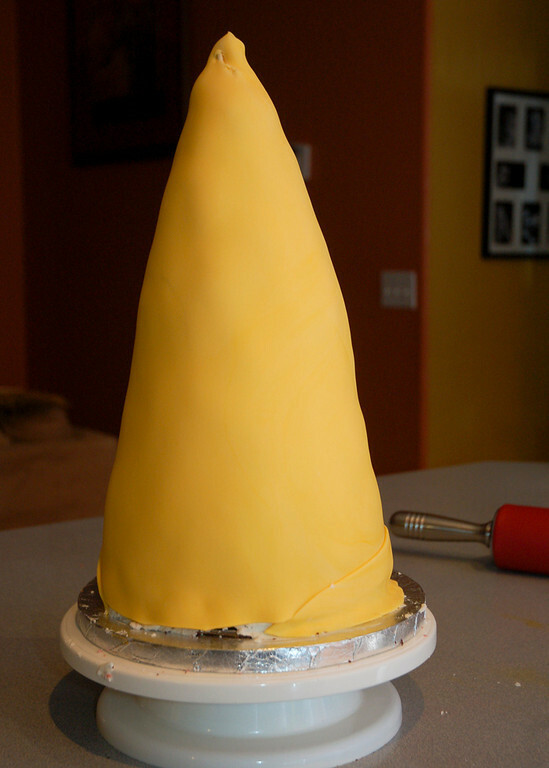 The only reason we’re doing this is to add stability, both when you carve the cake into the cone shape, and when you have to move the finished cake.Use a large serrated knife to cut off excess cake, creating a cone shape. Again, it doesn’t have to be perfect. Just get the general shape. 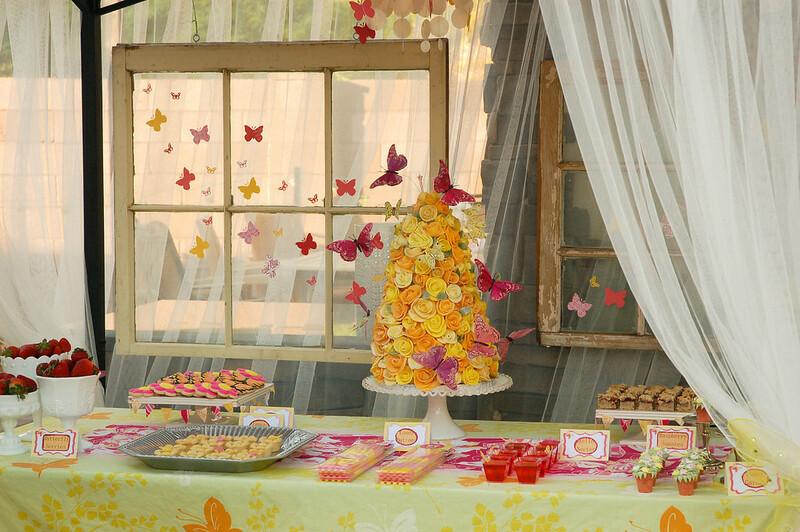 Keep all those delicious cake scraps to feed the family or make cake balls. Super Pearl Luster Spray and a sprinkle of disco dust edible glitter to give my cakes a little extra sheen and sparkle. It adds the perfect finishing touch, and makes the cake look much more professional. This cake is time consuming, yes, but it’s actually much easier to make something busy and completely covered like this look great than a supposedly “simple” cake. Have an imperfection in the fondant? Stick a rose on it! Indented the fondant with your finger? Stick a rose on it! And remember my favorite mantra in cake decorating: every cake has a back. It’s a great comfort when things aren’t going quite according to the plan in my mind! Nikki Wills is the creative force behind Tikkido and Tradewind Tiaras, Inc. She loves decorating cakes but not eating them, can’t sit still to watch a movie (drives her husband nuts), and has a deep and abiding love for Yorkshire pudding. Make sure to stop by Tikkido to see Nikki’s creativity like..
Wow! What an awesome tutorial. I have seen this cake before and have ALWAYS wondered how this could be done. Do people pick off the dry roses? Also, how do you unstack to cut? Genius! Thank you for this tutorial. It is simply astounding. I just kind of hacked at it from the top with a large serrated knife and cut my way down. 😉 Most adults tend to leave the roses behind, most kids tend to eat them. Wow! Wow! and Wow!! Cake is amazing and everything else is incredible!! Also, does the luster spray stay wet long enough for the disco dust to stick as you sprinkle it on? Thanks! This cake is so beautiful. 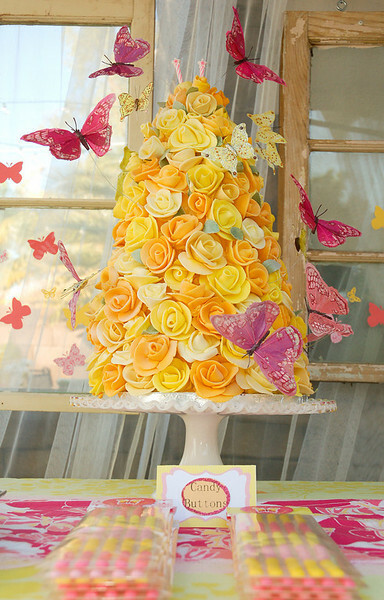 This cake is “jaw-dropping” gorgeous! I’m amazed at the detail and talent that went into this. Thank you very much for being our guest!! Your cake is absolutely beautiful! Thanks for sharing it with us! LOVE IT! Truly beautiful cake!